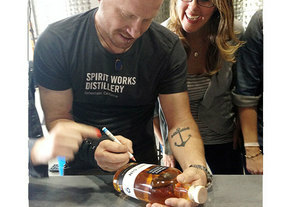 Spirit Works Distillery in Sebastopol recently released a barrel-aged gin. Photo courtesy of Heather Irwin. Christopher Long is the roving bartender of Libations Unlimited in Wine Country. Photo courtesy of Christopher Long. 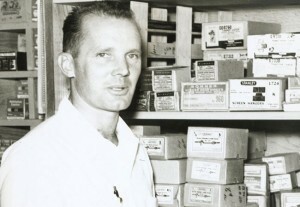 Chuck Williams in 1956. A Williams-Sonoma store will open in Sonoma this weekend. Photo courtesy of Williams-Sonoma. 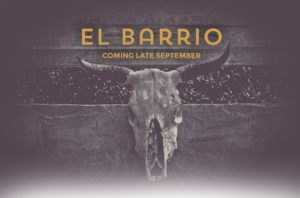 El Barrio opens in Guerneville. Image courtesy of El Barrio. 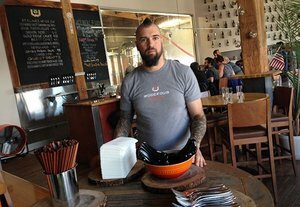 Chef Jamil Peden will leave Woodfour Brewing, but remain part of the Monday ramen pop-up. Photo courtesy of Heather Irwin. Bonnie Lynn Tempesta. Photo courtesy of Boncora Biscotti. 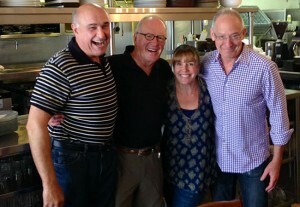 The new KSRO food lineup includes (from left) Steve Garner, chef John Ash, Marcy Smothers, and Clark Wolf. Photo courtesy of Marcy Smothers. On a recent tour of ~SPIRIT WORKS DISTILLERY~, BiteClub fell a little bit in love. Partly with owners Timo and Ashby Marshall’s Boston terrier, Bandit, but mostly with their newly released barrel-aged gin. Made from red winter wheat, the gin is aged in new white oak, imparting a rich amber hue and giving it a more intense, toasty flavor, with lots of vanilla, butterscotch, cardamom, and orange. It’s a perfect winter sipper. Try it mixed with a little eggnog or straight-up by the fire. Want to see the distillery for yourself? Guided tours are available Fri-Sun for $15 per person; reservations required. While you’re there, pick up a bottle of their vodka, rye whiskey, or sloe gin (a specialty of Timo’s family for generations), which are also available at local BevMos and specialty retailers. 6790 McKinley St #100, Sebastopol, 707-634-4793. Guerneville’s food and drink renaissance continues with the recently opened ~EL BARRIO~ cocktail lounge. It’s the next in a series of food and drink projects by Crista Luedtke, who also owns Big Bottom Market, Boon Eat + Drink, and Boon Hotel + Spa. The lounge replaces Whitetail Wine Bar, and the revamped interior includes custom-made Talavera tile and a graffiti wall installation by the Apexer, a SF-based artist. 16230 Main St., Guerneville. It doesn’t get much cooler than this, cocktailians. 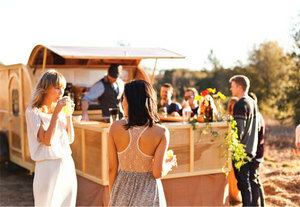 From his vintage-style teardrop trailer, bartender Christopher Long (Spoonbar, Campo Fina) roams Napa and Sonoma serving up artisan cocktails (aka liquid alchemy) at outdoor dinners, weddings, and other Wine Country gatherings. Libations Unlimited offers bespoke drinks for each event, including kegged cocktails, a beer tap, and his customized espresso machine. So much classier than your brother pouring too warm wine, that’s for sure. You can hire Long (yes, he has a beard and wears a vest like any good bartender) for your event at libationsunlimited.com or by calling 707-328-2132. Brawl of the bartenders at the Sonoma Bar Battle: Are there ever losers in a cocktail competition? Especially when the audience gets to be the judges? On Saturday October 11th, 14 local bars and restaurants will battle for the ultimate cocktail concoction. Did we mention that Charbay Artisan Distillery is the proud vodka provider and that Gloria Ferrer is hosting the sparkling wine cocktail contest? Tickets are $35 online and $40 at the door. Dancing, food, and a photo booth to document the merriment are included. All proceeds go to charity. Sonoma Veterans Building, 126 First St., Sonoma. Former North Bay chef Matthew Bousquet has turned up at SF’s ~PER DIEM~. His Windsor restaurant, Mirepoix, which earned a Michelin star, closed in 2011, leaving a hole in the Sonoma County restaurant scene. We’re happy to hear he’s landed in a new gig focused on seasonally inspired dishes (though they lean more toward Italian than Bousquet’s well-known French cuisine). Santé! In Napa, the owners of ~CA’ MOMI ENOTECA~ plan to open a second restaurant in downtown Napa. The menu is still under wraps, but expect their Oxbow Market enoteca (610 1st St., Suite 9, Napa) to continue focusing on authentic, to-die-for Neapolitan pizzas and pastries. The Oxbow location is one of the few pizzerias in the United States that’s certified by the authoritative Vera Pizza Napoletana association in Italy. Seating is limited at Oxbow, so we’re hoping to see even more “slow food” entrees (beef tongue, oxtail, and “obsessively Italian” pastas) in the larger restaurant space. 1141 First St., Napa. After several years of planning, permitting, and building, the kitchen outfitter Williams-Sonoma is returning to its Sonoma roots. In celebration of founder Chuck Williams’s 99th birthday, the store will (re)open on Saturday October 4th (that’s tomorrow) at its original Sonoma Square location; there will also be a cooking school and culinary museum. The landmark store opened in 1956, when a prescient Williams decided Americans might appreciate European-quality cookware. Just a few years later, Julia Child’s Mastering the Art of French Cooking kindled a firestorm of interest in high-end copper pots, pans, and knives. Sonoma County hasn’t had a Williams-Sonoma store since Williams moved his operation to San Francisco in the late 1950s. 605 Broadway, Sonoma. Saturdays get even tastier on local news station KSRO (1350 AM, 103.5 FM) with the debut of At the Table with Wolf & Smothers on Saturday October 4th. Wine Country food fanatics Clark Wolf and Marcy Smothers will dish each week on food news and personalities with guests such as Ruth Reichl, Emeril Lagasse, Bruce Aidells, Martin Yan, and Douglas Keane. The dynamic duo’s first show airs live from the Sonoma County Fairgrounds during the Harvest Fair this Saturday from 1pm-3pm. KSRO’s Saturday lineup also includes The Good Food Hour with John Ash and Steve Garner from 11am-noon and On the Wine Road with Jeff Davis from noon-1pm. Delicious! The food world lost a gourmet pioneer this week. Bonnie Lynn Tempesta, credited with introducing biscotti to the American food scene in the 1980s, died on September 25th at her Sonoma home. After founding La Tempesta Bakery Confections in the Bay Area in 1982, she became the largest biscotti producer in America, selling to Neiman Marcus, Starbucks, Macy’s, and Dean & DeLuca. 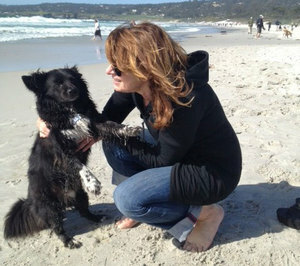 The entrepreneur sold her business in 1997, devoting her life to art, animals, and a program for disadvantaged youth. In 2012, she started a small philanthropic bakery in Kenwood named Boncora Biscotti, donating a portion of every sale to her favorite cause, Pets Lifeline of Sonoma Valley. Moving on from Sebastopol’s popular ~WOODFOUR BREWING~ is Jamil Peden. The creative chef, whose résumé includes Petite Syrah and Healdsburg’s Campo Fina, says he doesn’t yet have any plans, but welcomes the change. You’ll still find him at Woodfour’s ramen pop-up, Ramen Gaijin, on Mondays. There are some whispers about the new chef, who we hear is coming from a highly respected Marin restaurant, but no official word yet. A hearty hello to the forthcoming ~YETI RESTAURANT~, slated to open in the former Lyon’s location in Santa Rosa, near the intersection of Farmers Lane and Highway 12. Yeti has been a popular Himalayan/Indian restaurant in Kenwood for several years, offering some of the best naan BiteClub’s ever had. More details on when they’ll arrive soon. Dusk on the terrace at Cairdean Estate. All photos: © tablehopper.com. 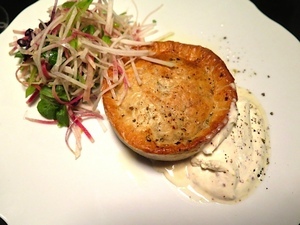 You game for some game pie? Humphrey’s squab and lobster salad. Communal table seating at The Farmer & The Fox. Photo: © tablehopper.com. 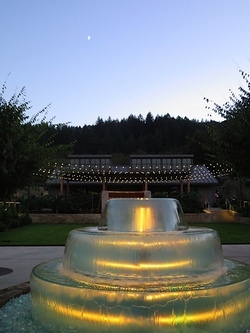 A Wine Country visit and review by Marcia Gagliardi. The next time you’re heading to St. Helena or Calistoga, you should think about stopping off at the newly opened Cairdean Estate on the St. Helena Highway, just at the base of Spring Mountain. The owners, winemaker Stacia and Edwin Williams, have done a good job transforming the former outlet center into a food-and-wine destination (which will be taking shape even more in coming months with a sensory tasting experience and mercantile). There’s a tasting room where you can try their extensive lineup (they have two estate vineyards, one in the Coombsville AVA of Napa Valley and the other in the Russian River Valley AVA), which includes an unoaked chardonnay, rosé (made from cab, merlot, and syrah), Russian River pinot, sangiovese, cabernet franc, and more. The tasting room has a gorg view of the valley at sunset, and here’s one more bonus: it’s open until 8pm nightly. 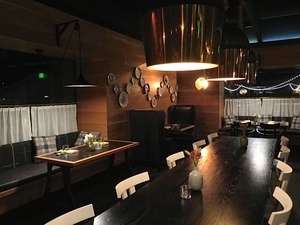 There is also a very stylish private room for club members for events and parties, with its own bar and fireplace. What I recommend is visiting the tasting room for a pre-dinner aperitif, and then saunter over to The Farmer & the Fox for dinner. The chef is Joseph Humphrey, who has a long legacy in Wine Country and San Francisco—the talented Florida-born chef got his start in New Orleans, and then came west to open the Restaurant at Meadowood. He was also the executive chef at Auberge du Soleil, Murray Circle, and then opened his own place, Dixie, in SF. Now he’s back in the 707, creating a modern, Napa-style version of a British gastropub. Start with a cocktail from bar manager James Kendall, who blew our collective minds with his creative and balanced concoctions. 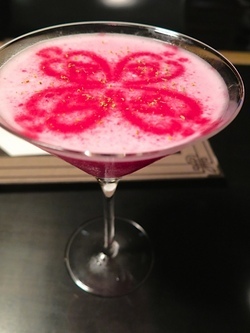 The Countess of Carrak is one of the most unique drinks I have had all year, with Krogstad aquavit, egg white, beet juice, lemon juice, and a dusting of fennel pollen (and the Cairdean logo stenciled on top). Kendall hails from Bouchon and Ad Hoc, and his handcrafted cocktails are destination-worthy in and of themselves. You’ll want to quickly order the cured salmon ($15) that comes on beer bread with curls of butter, spring onions, purslane, and herbs to keep the Countess good company. 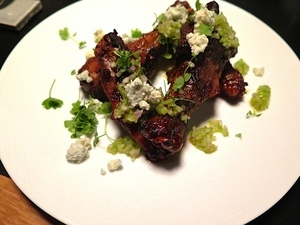 You should also make sure the smoked duck wings ($9) make their way over, a fun spin on buffalo wings (they come with crumbled Pt. Reyes blue cheese and finely diced celery), and of course the Scotch egg ($8) needs to be on the table—it’s spicy, with shaved horseradish and a watercress pistou. Humphrey’s team also shucks some fantastic Shigoku oysters (they come with a Mendocino seaweed mignonette). Of course there’s a burger ($16), with grass-fed beef, cheddar, and chips that get a clever dusting of vinegar powder. On the elegant side is a simple grilled fish ($21) with béarnaise, and check out that amazing price again. Bonus: it comes with rumbledethumps (!! ), battered and golden little potato, cabbage, and onion croquettes. Say it: rumpledethumps! 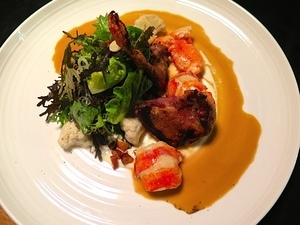 You can really dial in the luxe with the Paine Farm squab (cooked like a dream) and lobster salad ($32), with a stunning jus made from the two, balanced by the prickly heat of a baby mustard salad on the side. All the dishes have Humphrey’s refined touch, mad culinary technique, and soigné plating, with such well-sourced ingredients. Unfortunately the desserts looked impressive but didn’t particularly stand out for various reasons (we tried the butterscotch mousse cake, roasted peach rice pudding, and ginger ice cream cake). But the after-dinner drinks, like the Spanish coffee (Kahlúa, Combier, coffee, whipped cream, and burnt sugar rim) ended things on a high note. The restaurant doesn’t charge a corkage, which is pretty notable. Our server was friendly and well schooled on the menu, but our meal took a long time, with lags in service that I would have understood with a busier restaurant. It’s a location that doesn’t have food traffic—people will need to know about it before heading over—so I imagine biz will pick up in time. It’s still relatively fresh and new. But as the word spreads about Humphrey’s hearty-yet-elegant cuisine, the killer cocktails, and the stylish dining room that’s well designed for groups (there are plenty of booths), people should start filling it up. There were a bunch of fun residential design details, from the homey plates on the oak-paneled walls to the Welsh blankets and leather wingback chairs. It’s the kind of design that makes you instantly comfortable (although they could turn the overhead lights down a touch—then again, it made for some excellent food photography lighting, ha-ha). If you’re around during the daytime, pay a visit to Butterscots Bakery, Deli, and Culinary Market (open daily from 7am-5pm). You can get your morning coffee and a house-baked croissant or a scone if you’re on the run, or sit on the fab patio for a nice lunch or afternoon snack (there are also picnic tables, plus an outdoor fire pit for evening chillaxing with a glass of wine). You can choose from a pretty significant array of salads (great to go as well), sandwiches, unique breads (including seaweed, curry brioche, and Scottish beer bread), cookies, and pastries. Oh yeah, and puddings! 3111 St. Helena Hwy. at Ehlers Ln., St. Helena. Restaurant: 707-302-5101.